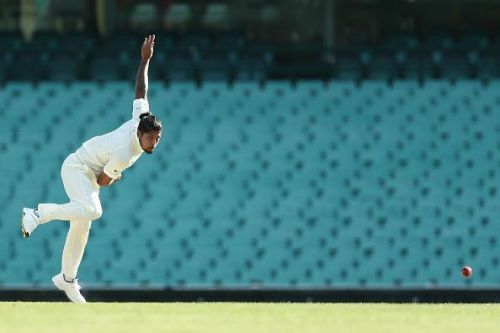 Umesh Yadav destroyed Kerala with a fiery spell, picking up seven wickets as Vidarbha took control on the opening day of the Ranji Trophy semifinal at the Krishnagiri stadium here Thursday. The defending champion reached 171 for 5 in 45 overs after winning the toss and bundling out Kerala for 105 in the first innings. Yadav, who was part of the India team that won the Test series in Australia recently, ran through the host batting line-up, took a personal best 7 for 48 as the host folded for 105 in just 28.4 overs with just three players reaching double figures. Vishnu Vinod, captain Sachin Baby and Basil Thampi were the only Kerala batsmen to make double-digit scores. On a pitch which was on the bouncier side, the burly paceman posed the Kerala batsmen a lot of trouble and was ably assisted by Rajneesh Gurbani (3 for 38), the star of Vidarbha's maiden Ranji triumph last season. Yadav also reached the 100-wicket milestone in Ranji Trophy during his brilliant spell. His first victim was opener Mohammed Azharudeen caught by Y R Thakur for 8. He then had Sijomon Joseph taken by R Sanjay for a duck. When Gurbani sent opener P Rahul for 9, Kerala looked in a spot of bother at 27 for 3. There was no respite as Yadav kept up the pressure by bowling with fire and discipline. Loss of wickets at regular intervals left the host in deep trouble and there was a danger of being shot out for a sub-100 first innings total. The usually reliable Jalan Saxena, who came up with a crucial knock in the second innings of the Quarterfinals against Gujarat, fell for a single digit score. Vishnu Vinod, the top scorer with 37 (50 balls) went for his shots and added 25 runs with number 11 MD Nidheesh (7) to take Kerala past 100 before Gurbani dismissed the latter. In reply, skipper Faiz Fazal (75) and Sanjay (19) provided Vidarbha a solid start before the latter was castled by Nidheesh. Veteran Wasim Jaffer, who joined Fazal, helped the reigning champions consolidate with a superb 80-run stand. The two played some delightful strokes on both sides of the wicket and showed how to bat on what was not an easy track. The stylish Jaffer breached the 1000-run mark for the second time in his Ranji Trophy career. He became the first batsman in Ranji history to achieve this landmark on two separate occasions. During the 2008-09 season, he had aggregated 1,260 runs for Mumbai. Jaffer (34) departed to a catch by KB Arun Karthick off Nidheesh's bowling. Fazal, who led from the front with a fine knock, added57 runs for the fourth wicket with Atharva Taide (24). His exit, to Sandeep Warrier for a well compiled 75, sparked a mini-collapse as Vidarbha lost three wickets for one run to end the day at 171 for 5, a lead of 66 runs.